Several versions available for different host simulators! 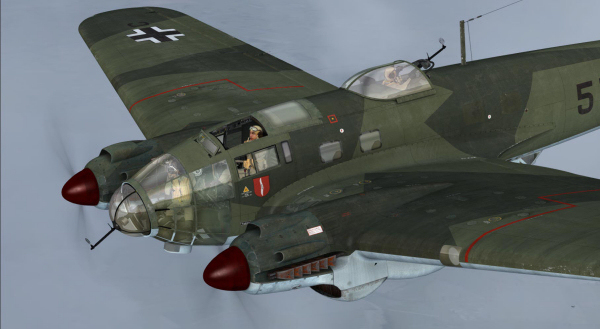 A new Heinkel He 111 P2 bomber from Aeroplane Heaven is now on sale. The aircraft comes in ten authentic paint schemes, features PBR materials for amazingly realistic effects such as weathering, paint deformation, scratches and dents, and is detailed right down to the tyre treads. Features include stereo sounds, animated 'Ikara' gun mount and ring, accurately simulated hydraulic lock system for flaps and landing gear, realistic bomb-drop sequences with characteristic tumbling bombs, authentic animations and animated crew figures. If you are running FSX and/or P3D up to and including v4, buy this package. If you are running P3D v4.4+, buy this package. If you are running ALL simulators (i.e. FSX & P3D v3, v4, v4.4+, buy this Bundle.